There are a lot of ways to cut your items out and there is no right or wrong method. Some methods are more efficient than others, but not everyone will find the method the most efficient for them. Due to the nature of all sewing cutting implements, you will want to protect your cutting surface (counter, kitchen table, etc) with a cutting board. Sewing scissors can scratch your cutting surface. It is always a good idea to use a cutting board. There are two main types of cutting boards used in the sewing industry – traditional cardboard cutting boards and rotary cutting mats. Traditional cutting boards are your basic sewing cutting board and are cost effective for the beginner sewing student. Rotary cutting mats are a special type of cutting board for rotary cutting devices. Without these specialized mats, you can severely damage your cutting surface so it is highly encouraged to buy the largest one that fits your cutting area. You can get by with a smaller size but often sewers are quickly longing for a larger size to improve speed and efficiency. The basic type of cutting board is the type that many of us in our 40s or older remember from our childhood. They were this huge cardboard grid that showed up on the floor, table, or bed repeatedly. Today, these cutting boards have not changed much. The major changes I have seen is how small they fold down to. The cardboard cutting board has some benefits over their rotary counterpart. You can stick your pins right into the board. This ability is useful when you need to make slight adjustments on patterns or mark dart positioning, etc. Traditional cutting boards can also be folded for storage in the upright position. They are fairly cheap and durable, but may need to be replaced after a certain amount of typical wear and tear. Rotary cutting boards were designed to be used in combination with rotary cutting devices. 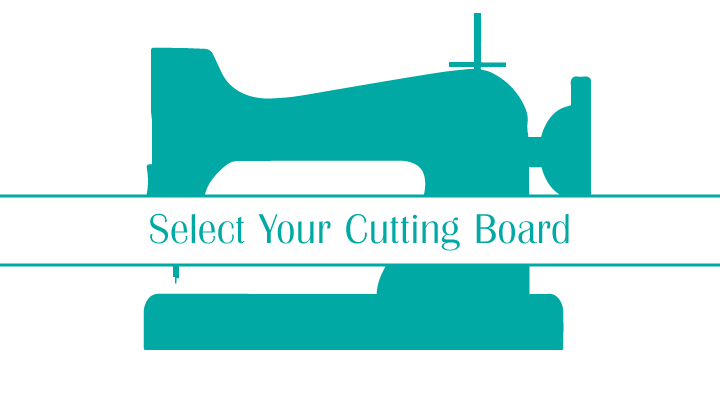 When you are shopping for a rotary cutting mat, there will be a wide variety of options. It seems that every cutting implement manufacturer also makes a rotary cutter and rotary mat as well as their other lines of cutting instruments. This is not necessarily a bad thing, but it does leave a lot of room for trial and error. When you are comparing your options, you should consider whether the rotary cutting board or cutting mat is made out of plastic or is a self-healing board. Since these mats are manufactured from a few different materials, this is important to note. Some materials have a longer life than others. My recommendation is to always search for the self-healing mat option. It will offer the longest life for the product. This does not, however, mean that the mats will last forever. Your product’s lifetime may vary. These are prone to warping if store or used in the wrong environmental conditions. Also repeat cutting in the same location on the mats can cause even the self-healing mats to develop grooves in the surface of the mat. What size cutting board do I need? You have probably noticed that there were a variety of sizes available. Each has their use case. Traditional cardboard cutting boards are fairly standard in size. They fold up, so they can be adjusted to fit a variety of cutting surfaces with ease. Rotary cutting mats come in a wide range of sizes. You may find that you need/want more than one size based on what you will be sewing. For a general purpose cutting board, I recommend that you go with the size that fits comfortably on the cutting surface of your choice. You would not want to put a 36″ wide mat on a table that is only 32″ wide, it would not be wise or prudent. Having a good idea of where you will be cutting is beneficial when making your decision. The biggest drawback I have noticed in rotary cutting mats is the size limitations. Obviously the larger the mat, the larger the price tag that goes with the mat, but sometimes they can get excessively priced once you get over the size recommended above. Know your budget before you go shopping. Remember that the larger the mat, the less portable your cutting surface is as well as harder to store if you ever find it necessary to do so. When you need to store this type of cutting board, you need to store it in a flat and horizontal position for optimal results. Which Cutting Board Do I Need? You are the only one that can decide which method of cutting you will use. It is important to know your options before making this decision, however. If you are going to do strictly clothing construction, then the traditional cardboard cutting board may be your best and most economical option. For those that are going to only be quilting and other sewing crafts, a rotary cutting mat is essential. Those likely to do both, should consider one of each type of cutting board. What is your favorite brand of cutting board? What is your favorite size cutting board and why?